Playing Poker Using Bitcoin And Cryptocurrencies? You Can Do It Now With GGPoker! Hello, my name is Scrimitzu and I’ve been playing poker for more than nine years now, living off it for seven. I’m also a professional poker coach, having taught more than 500 people around the world. I’ve played along the years on many poker sites, but there are a few factors that made GGPoker my permanent home. When I started playing on this site, I was just trying to see how it is. But after the first month I made some money so obviously I was wanting to cash in on my winnings. Surprised I was when I had received my withdrawal to my Skrill account in merely minutes. Never had I ever encountered this. One more thing that is a bit more recent and I have been enjoying, based on the fact that I also trade cryptocurrency, is that you can now deposit with a plethora of cryptocurrencies! GGPoker now accepts Bitcoin, Litecoin, Bitcoin Cash, BlackCoin, Dash, DigiByte, Dogecoin, Ethereum Classic, Ethereum, Expanse, Game Credits, Komodo, LISK, NAV Coin, NEO, PotCoin, Stratis, Syscoin, Vertcoin and Waves! That’s a high variety of crypto right there, and the best part is that if you deposit with cryptocurrencies, you get 10% bonus on top of your deposits immediately! This is a limited time offer, so act fast! 200% bonus of up to 1000$! If you deposit to GGPoker, it means that you get a 200% bonus on your deposit. Let’s say for example you deposit $100 or $100 worth of any cryptocurrency. This means that you get $200 in bonus money that you unlock in $10 increments when you play at the GGPoker tables. You will always see a slider in your bonus section telling you how much more you have to play until your next $10 increment is released to your account. Normally it’s not that much. What’s the Tournament Leaderboard you might ask? Play in any tournament or Fortune Spin games in a given month to collect Leaderboard Points. The larger the player pool or stake, the more points available at the end of that game. There’s no entry requirements, just enroll and compete by playing. The poker software just looks and feels great, period. Nowhere have I seen such implication in making a poker client look good, feel good and have so many features. There are emojis, you can straddle at the tables for how much you want from any position, you can even no look all in! You can propose to your opponents to run it two or three times and you can get all in insurance at no cost so that if your lucky opponent hits that two outer on the river you can still get your money back! From the looks of this lobby you can properly see that there are many forms of poker that you can play, from Hold’em and Omaha Cash Games to All-In or Fold tables, Fortune Spin which are a random prize pool hyper speed format, and the revered Tournament format. Also, no poker helping software is allowed, so you don’t have professionals having an unfair edge on you at the poker tables. This is a feature most poker websites lack nowadays, so it’s very refreshing for the recreational player to be able to play knowing he won’t get ‘read’ online. Even if you own a Mac or just an Android / iOS device, you can still play GGPoker. For all you Linux and Chromebook users, don’t fret. A web-based version is in planning. You’ll be able to play too. 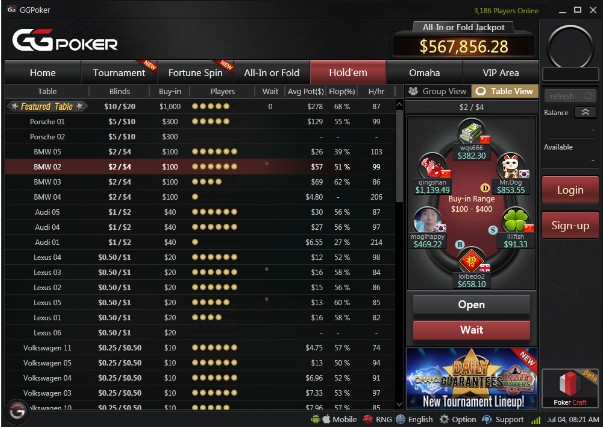 GGPoker has recently introduced the Fish Buffet player reward system, which is the best rakeback I’ve ever encountered. At the lower levels you get 30% of your rake paid back to you when you finish, at higher you get an average of 50% of your rake paid back to you, but it can go up to 100%! If you reach the Shark and VIP levels, you can spin wheels and win prizes between $1000 and $3000! How often you get these amounts doesn’t depend on time, it only depends on how much you play! You can get them really often! If you just want to test out this software, just make an account here and try some of the Chinese Zodiac Freerolls. They run every two hours and have free cash prizes! If you can beat your opponents, then you win free money that you can throw afterwards at paid entry tournaments so you can win way more money, or you can withdraw! Their promotions are often and wide, for example in January they made it so that everyone who plays a certain amount of poker cash game hands will get a ticket to a $28.000 guaranteed poker tournament! Now that’s what I call value! A lot can be said and more can be discussed but I think this is enough to convince you to give it a go! This is a guest post wrote by Tudor Scrimitzu, Professional Poker player & Streamer. He wrote multiple poker books – available on CrushTheMicros. You can see him playing poker daily on Twitch.